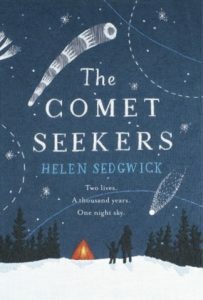 The Comet Seekers, by Helen Sedgwick, is the story of Róisín and François, their travels, and the people they leave behind as they travel the world. We meet them on an Antarctic Survey expedition where Róisín, an astronomer, is studying comets, and François is a chef. But that’s not where they met, although they don’t realise it at the time. And that’s not the only connection between the two. The story loops back through their lives, all the way back to their childhoods. Róisín’s defining relationship is with her cousin Liam, whose connection to his father’s farm anchors him to the land; François’ defining relationship is with his mother, Severine, who is anchored to her home town of Bayeux by her own ancestral chains. The journey of Róisín and François’ lives is defined by the conflict between their desire to travel, to see the world, while not wanting to leave their loved ones behind; their loved ones who can’t leave, for their own reasons. At times their lives interact, tangentially, their orbits grazing each other before spiralling off on their own paths again. We get glimpses of their lives only when there is a comet in the sky. Róisín has been fascinated with comets since she was a child; and while François has no great interest, his mother Severine does, because when a comet appears, so do the ghosts of her ancestors. It’s because she can’t bear to leave the ghosts behind that she can’t leave Bayeux, can’t give François the life of adventure he wants. We hear the stories of the ghosts, of Severine’s ancestors – again, only glimpses when there was a comet in the sky. We hear the story of Severine’s family back a thousand years to the time of the Norman Conquest; from Aelfgifu (who appears on the Bayeux Tapestry, which also contains the most famous of comet depictions, the arrival of Halley’s Comet in 1066) through Brigitte whose ghost appears wreathed in flames, to Severine’s grandmother, who herself was the custodian of the family ghosts. And it’s this core of the book, the central story of Severine and her ancestors across a thousand years, that gripped me the most. The stories of Róisín and François have their heartbreak, and they’re haunted by regret, but also have the hope of freedom and happiness; like comets whose orbits go round and round the sun time after time, there’s still the chance that the cycle can be broken. There’s a nebulous border in the book between the metaphorical ghosts that anchor us and hold us back, and the supernatural ghosts that tie Severine to her home and deny her the life she wants. Her love for François and desire for him to live his life is the most touching relationship in the book. She’s had to deny him a life of adventure, but she’s taught him to cook, to appreciate and learn about the world through food, and it’s this skill that gives him a chance to go out into the world, even if that means leaving her behind. This is a wonderful book. Severine and her ghosts will stay with me for a long, long time.